Not to be confused with Crockett County, Texas. Crockett is a city in Houston County, Texas, United States. As of the 2010 census, the city population was 6,950. It is the fifth oldest city and the county seat of Houston County, the oldest county in Texas. The town was named after David Crockett, who reportedly had camped nearby on his way to the Alamo; the site was very near the Old San Antonio Road. A family from Tennessee donated the land for the town and named it after Crockett, whom they had previously known. The town was incorporated in 1837, and a post office was granted the following year. Crockett was connected to Nacogdoches by stage service. In 1839 raids by the Alabama-Coushatta and Cherokee Indians forced the town's residents to take shelter in the fortified log courthouse. Crockett was a training center for Confederate conscripts during the Civil War. The railroad came through in 1872, enabling Crockett to exploit the county's timber resources. By 1885 the town was thriving with a population of 1,200, and the following year a school was opened for black girls. It evolved into Mary Allen Junior College, which operated into the 1970s. In 1904 lignite mining started, peaking about 1910. The stands of timber were seriously depleted by the 1920s. The population was over 3,000 in the mid-1920s, and by 1936 it was nearly 4,500. The population of Crockett increased while most of East Texas declined after World War II. It had reached 5,000 by the 1960 census. During this time, one of the first loop roads in the nation (Loop 304) was built around the city. This traffic reliever was procured through the works of heavyweight politicians who called Crockett home. Blues singer Lightnin' Hopkins was once arrested in Crockett. In recent years, the economy of Crockett has expanded with the construction of new retail space on Loop 304. Several historic buildings in downtown have been renovated to accommodate new office and service space. Renewed interest in reserves of natural gas in the surrounding area has led to construction of energy infrastructure and receipt of royalty revenues for land. In 1854, A.T. Monroe, a grandnephew of U.S. President James Monroe, came to Crockett from Virginia. He established what is now the Monroe-Crook House, built with brick placed between the inner and outer walls. George W. Crook purchased the residence in 1911. The house, open for public tours, is located in front of the John H. Wooters Public Library in the same block as the Crockett Presbyterian Church. The Presbyterian Church was established in 1854. The building was razed by a fire in 1926 and rebuilt. The United States Postal Service operates the Crockett Post Office. The Texas Youth Commission operated the Crockett State School in Crockett. However, the facility closed on or around August 31, 2011 and is no longer in operation. 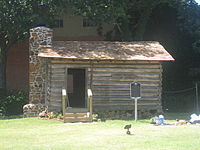 The historic Strode-Pritchett Cabin was located to Crockett for the 1976 bicentennial. At the site is a painting of Davy Crockett by the artist Lucas Short. Crockett is located near the center of Houston County at 31°19′1″N 95°27′30″W﻿ / ﻿31.31694°N 95.45833°W﻿ / 31.31694; -95.45833 (31.317010, -95.458397). Several highways converge on the city. U.S. Route 287 leads north 35 miles (56 km) to Palestine and southeast 46 miles (74 km) to Corrigan. Texas State Highway 21 leads northeast 33 miles (53 km) to Alto and southwest 38 miles (61 km) to Madisonville at Interstate 45. State Highway 7 leads east 54 miles (87 km) to Nacogdoches and west 33 miles (53 km) to Centerville along I-45. State Highway 19 leads south from Crockett 48 miles (77 km) to Huntsville. According to the United States Census Bureau, Crockett has a total area of 8.8 square miles (22.9 km2), all land. The city is within the Trinity River watershed, with the north side of the city draining toward Hurricane Bayou, which joins the Trinity River west of Crockett, and the south side draining toward Gail Creek, a tributary of White Rock Creek, which joins the Trinity at Lake Livingston. The terrain of the town is hilly and (as with many East Texas towns) contains significant forest, mostly loblolly pine and pecan trees. As of the census of 2000, there were 7,141 people, 2,672 households, and 1,747 families residing in the city. The population density was 805.6 people per square mile (311.2/km²). There were 3,081 housing units at an average density of 347.6 per square mile (134.3/km²). The racial makeup of the city was 48.54% White, 44.67% African-American, 0.36% Native American, 0.46% Asian, 0.14% Pacific Islander, 4.78% from other races, and 1.05% from two or more races. Hispanic or Latino of any race were 10.50% of the population. There were 2,672 households out of which 31.1% had children under the age of 18 living with them, 38.5% were married couples living together, 23.3% had a female householder with no husband present, and 34.6% were non-families. 31.3% of all households were made up of individuals and 16.7% had someone living alone who was 65 years of age or older. The average household size was 2.46 and the average family size was 3.08. In the city, the population was spread out with 29.8% under the age of 18, 8.9% from 18 to 24, 23.1% from 25 to 44, 19.2% from 45 to 64, and 18.9% who were 65 years of age or older. The median age was 35 years. For every 100 females, there were 85.5 males. For every 100 females age 18 and over, there were 75.5 males. The median income for a household in the city was $21,455, and the median income for a family was $27,069. Males had a median income of $26,098 versus $18,674 for females. The per capita income for the city was $11,708. About 26.6% of families and 33.9% of the population were below the poverty line, including 44.6% of those under age 18 and 26.0% of those age 65 or over. Crockett is one of the poorest cities in the United States. Most of the city is served by the Crockett Independent School District, although a few acres of the city limits are within the Latexo Independent School District. Crockett is home to the Jordan School - a private, co-educational institution operated by the local Episcopal Church. It currently serves Pre K & Kindergarten levels. They have partnered with Vista Academy, which serves 1-6th grade. The climate in this area is characterized by hot, humid summers and generally mild to cool winters. According to the Köppen Climate Classification system, Crockett has a humid subtropical climate, abbreviated "Cfa" on climate maps. ^ a b "Geographic Identifiers: 2010 Census Summary File 1 (G001): Crockett city, Texas". American Factfinder. U.S. Census Bureau. Retrieved March 15, 2018. ^ Gannett, Henry (1905). The Origin of Certain Place Names in the United States. Govt. Print. Off. p. 96. ^ "Post Office Location - CROCKETT Archived 2010-08-29 at the Wayback Machine." United States Postal Service. Retrieved on August 8, 2010. ^ "Crockett State School Archived 2011-02-20 at the Wayback Machine." Texas Youth Commission. Retrieved on August 8, 2010. ^ "TYC Announces Closure of Three Facilities Archived March 5, 2012, at the Wayback Machine." Texas Youth Commission. Retrieved on July 3, 2011. ^ Comen, Evan. "America's 30 poorest towns". MSN. Retrieved 19 June 2018. 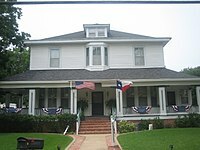 Wikimedia Commons has media related to Crockett, Texas. MythBusters – "Davy Crockett's Magic Bullet"
This page was last edited on 26 November 2018, at 05:14 (UTC).